PG David Appleby and MOSSAR members are shown here participating in the 119th NSSAR Congress at the Renaissance Waverly Hotel in Atlanta, GA.
Front row (L-R): Laura DeVenney, Brigadier General Gerald R. McCoy; Carolyn Grover; Raylene Appleby; Sue Craft; and Timothy I. McCoy. 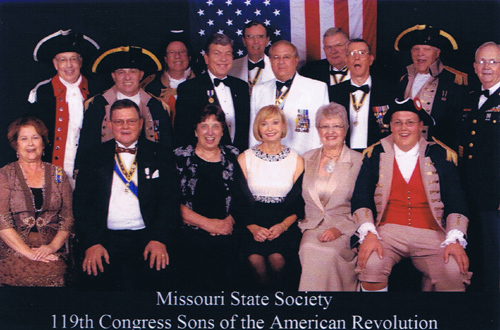 Middle row (L-R): Brigadier General Steven M. Baldwin; Missouri U.S. Representative Roy D. Blunt; S.A.R. President General David N. Appleby; and Major General Robert L. Grover, MOSSAR Color Guard Commander. Back row (L-R): Captain Russell F. DeVenney; Captain James L. Scott; David J. Gray; Dennis R. Craft; Keith K. Brown, Sr.; and MOSSAR State president Daniel McMurray.